Want to learn the one thing that can absolutely transform your success online? Iinside you'll discover how to build huge lists of subscribers that can pump your bank account with cash! The money is in the list... I'll show you how to build that list! In my opinion build a mailing list is the single most important thing you'll EVER do in your online business. It has the power to totally transform your success online! 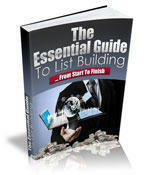 Quite honestly, once you have built a list you'll never look back with your online business. If you've ever wanted to be able to make sales on tap then you MUST get into email marketing. Of course you have to treat your list right, but as long as you're making valuable recommendations to your subscribers then you can earn a fortune. If you have a list you can literally go onto a site like JVZoo or WarriorPlus, find good quality affiliate offers to promote, send an email out to your list and see sales dropping into your account within MINUTES. Well it IS - but the downside of course is that you have to build a list in the first place.